It was a hot, salty summer day, and I was LIVING for the moment my husband got home. The kids and I were on our last strands of patience. We were tired and grouchy and so sick of our house and, frankly, each other. We were trying to keep it together, because we had BIG plans to head to the local park’s wading pool when Daddy got home at 5:30. An OhmHour was coming at 6, and I was gonna be darned if we were still in our un-air-conditioned house when it started. “I got a little caught up, but I’m coming home. 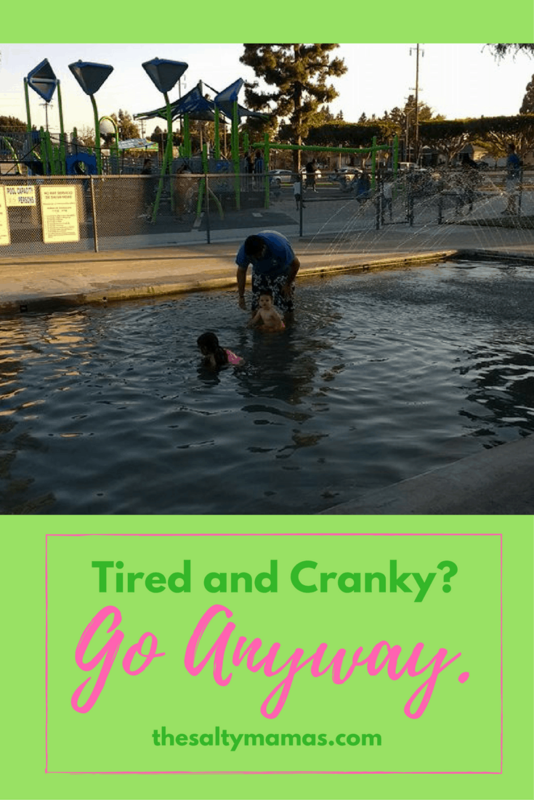 I thought we were going to the wading pool.” And I almost lost it. We’d had a DAY, and there was just so much logisticking to do that I thought my brain was gonna fall right out of my head. The prospect of suiting them up and sunscreening them down and driving them over for only forty-five minutes of fun before unsuiting and towel-drying and redressing? I just. Didn’t. Want to. But because we had no electricity, and it was either go to the wading pool or stay in a hot house with my cranky kids, I decided to give it one more bit of effort before I called it. I rechecked the times and found they didn’t close until 7:30. Truth be told, I was still less than willing to suit them up for those 45 short minutes, but heck, I had promised the wading pool already. And frankly, I didn’t feel up to being the bad guy that made the call that it wasn’t worth it. So my husband rushed home, I suited and sunscreened them babies, and away we went. And, you guys. We had the best. Night. Ever. 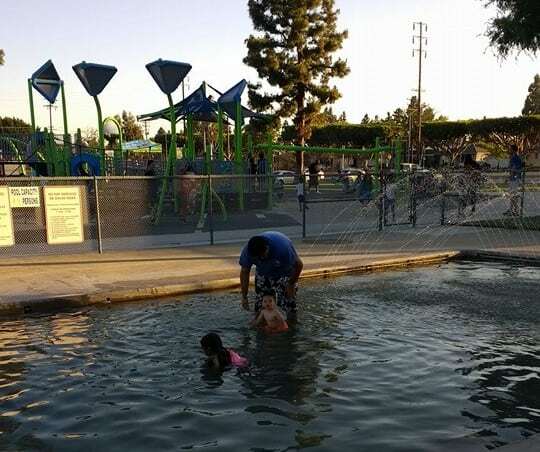 It turns out that 45 minutes is exactly the right amount of time to be at a wading pool. And the later you go, the less odds that other people will still be there. And you might just get the wading pool to yourself, with your husband and your two small, perfect children, and you might look romantically at each other over their perfect little heads while the sun literally sets behind your husband’s happy face. And then you might go out for ice cream and kiss that sweet baby’s cheeks and smell his sunscreeny head and nearly burst from happiness while your daughter tells you that this is her most favoritest day ever. And you would have missed all that if you’d decided to sit around being crabby at your husband and your kids. Don’t get me wrong, there are days to be mad. There are times when you have to turn on the TV for hours, or bicker with your husband about coming home late, and sometimes things get cancelled because you just can’t. There will be tense words and rushed dinners and early bedtimes. And that’s okay, too. Because that’s real life. But once in a while, you’ve gotta embrace the lucky chances, push through the cranky, and go anyways. You’ve got to decide to be tired and crabby later, and be a family now, because we never would have gotten last night back. There will be cool drinks to ease the pain of long days, and bedtime will eventually come whether we enjoy the evening or not. But we need to take the time to embrace each other now. Cause I’m not gonna remember the irritation of the day (well not FOREVER anyways) but I’ll remember that perfect evening with my almost-perfect family for a lifetime. I’m glad you went ahead and did it! Sometimes not following through with out plans can really get to us. It was just a perfect amount of time! Right? The disappointment alone would have been too much for me! I’m so glad we went for it in the end. It sounds like you had a wonderfully intimate family outing to the pool! I’m glad you all decided to go despite the late hour! such a beautifully written post! You’ve inspired me to make the most of my day. Thanks for sharing this story! I’m glad you went! You guys sound like you had the best family day! I absolutely love this reminder! It’s so true. There are so many times when I’m faced with being a poopy pants or making the best of the situation. In the long run it’s always best to make the best of the situation. But, I totally feel you on the sunscreen. That stuff is no fun to put on! I wish they had these types of water fun around our area. We hae to travel to PA for anything like this. I’m so happy for you that you decided to go! I struggle with getting past the mental block that wants to stop you from going outside your comfort zone.